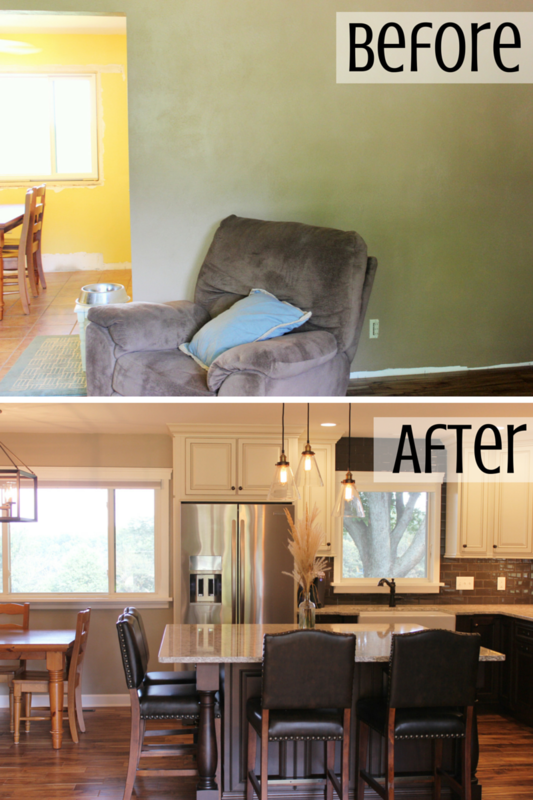 This Bettendorf, IA kitchen remodel is a great story to feature because we are sure many of you readers can relate to it. How many times have you started a project with your partner and your tastes just aren’t matching up? Could be as simple as deciding what movie to watch…could be as complex as selecting the look for your new kitchen. This is such a common challenge with many of our clients. If you know anyone that has gone through the remodel process or built a home you know that it can be difficult to make all of the selections for the project. 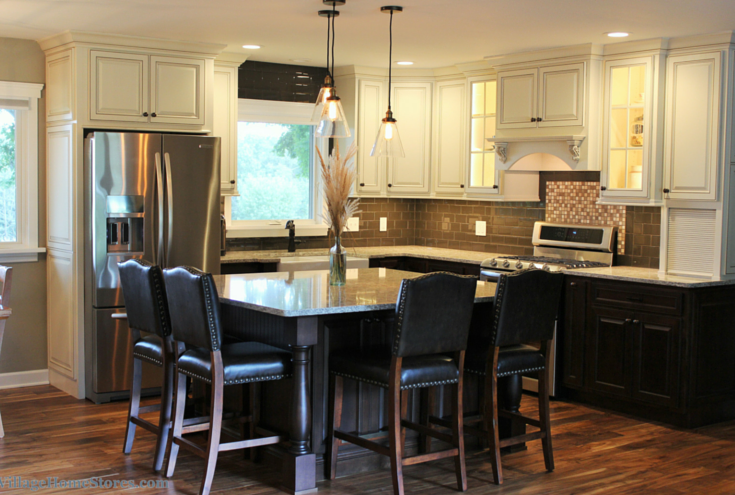 We would like to give a huge round of applause to this fun Bettendorf couple for including their designer from Village Home Stores in on the process and letting this kitchen become the result of a shared vision. The final result of this collaboration of styles and selections is remarkable. His and Hers tastes collide in a great finished look. “His” tastes are more modern, sleek and contained while “Her” tastes are more classical lines and styles. Taking this information into consideration was important for their Kitchen Designer during the layout and selection process. This L-shaped kitchen layout with a single-level island includes Stainless steel appliances and a two-toned finish choice for the cabinetry. Plenty of space for multiple users to work within this new design and seating at the kitchen island as well as a nearby dining table. New hardwood floors were installed throughout this entire new area and walls were removed to open up this main level into one large space. 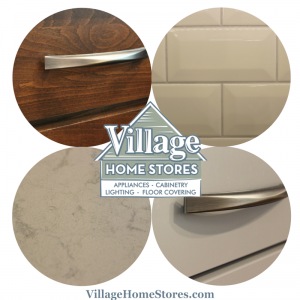 While Village Home Stores does have a full Project Management program available to our customers, we realize many of you may want to do some parts of the work yourself. 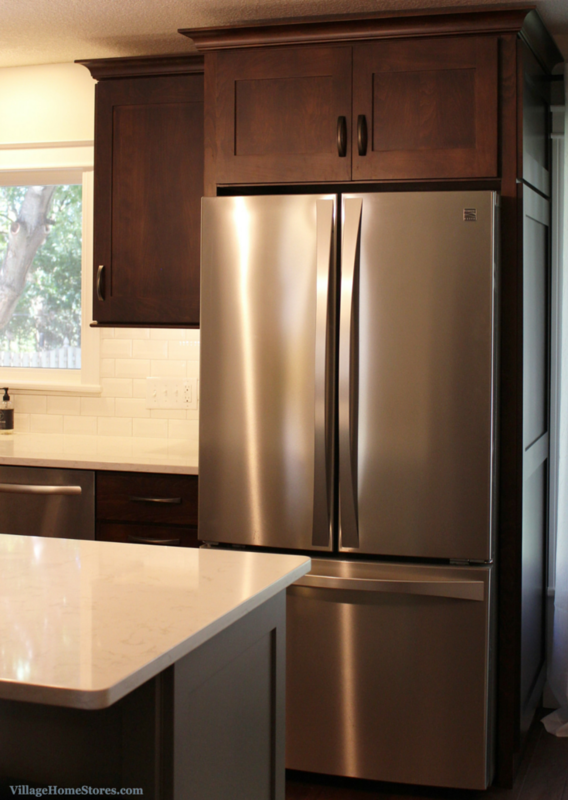 In this case we were able to provide a reliable and expert carpentry crew to install the new kitchen and all of the rest of the project was handled by the customer. The work done at the home was extensive. One of the biggest layout changes was moving a staircase from the front entry (shown on right) to a new location in the living room area (shown on left). Just like any blend of tastes, you have to leave room for both sides of the story to be told. Some areas allow more easier direction than others. For instance, your backsplash tile can really be what “tips the scale” from Traditional to Modern because it is really an expressive material to work with. 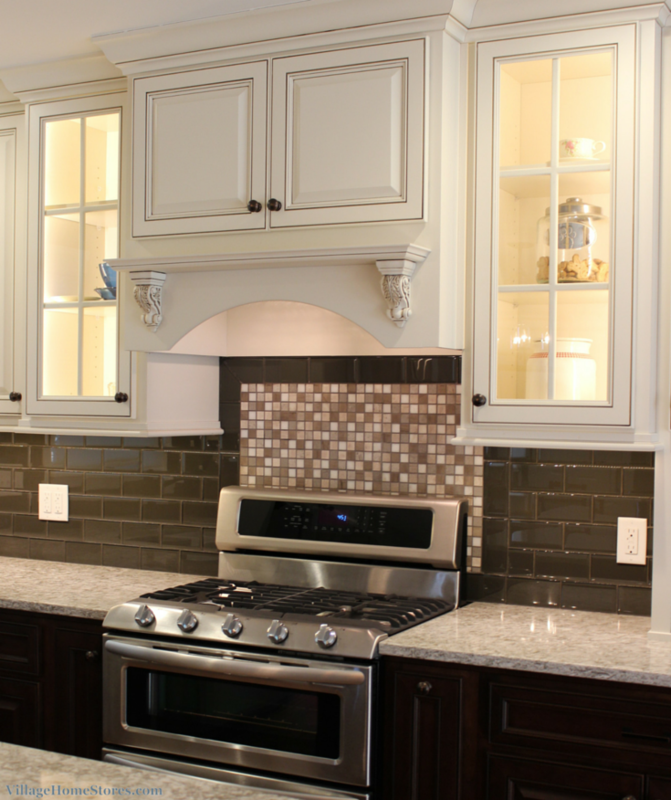 Your backsplash choice makes such a huge impact on the overall finished look. 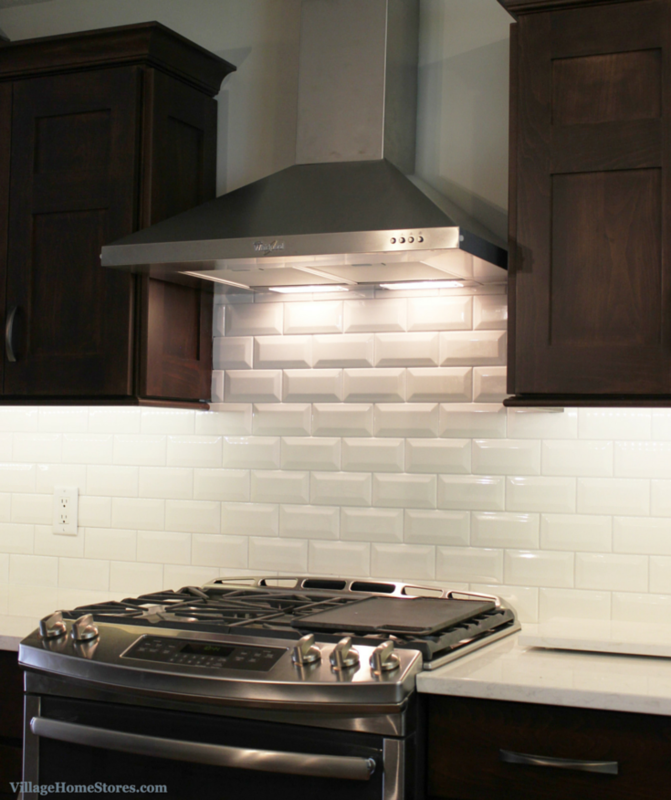 Instead of a mosaic of materials or introducing a new element to the backsplash, a classic and timeless look was decided: white subway tile. This look is so versatile for many styles and it fits right at home here. For a more Modern edge to this classic look, a beveled tile was used. The bevel on the tiles create a shadow and add interest and texture to the layer of material. 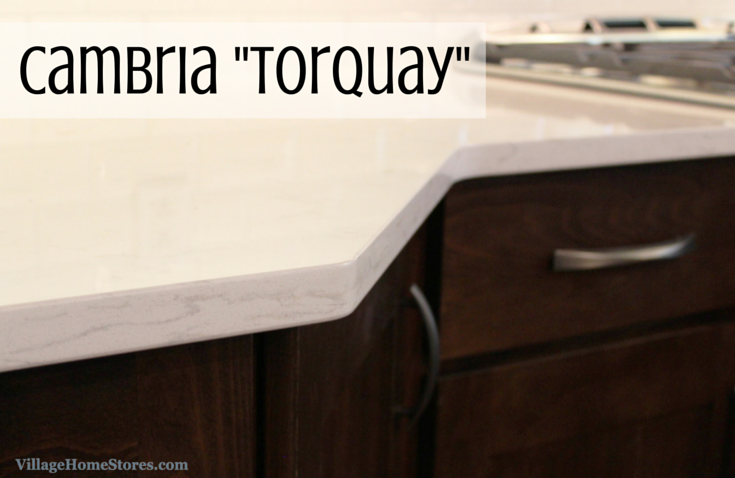 Below that beveled subway tile sits a Cambria quartz countertop in the “Torquay” design. This subtle quartz choice is durable and here it gives the perfect sophisticated look. 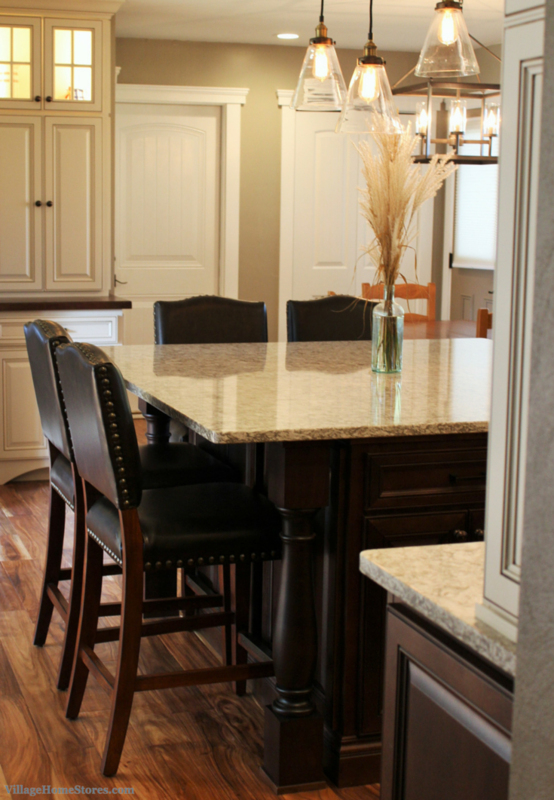 The same “Torquay” quartz is installed on the kitchen island as well. Our kitchen designer at Village Home Stores included base and wall cabinets on the end of the run of cabinetry that are typically installed in a corner application. the result: more surface area on the countertop below! Far away from the cooktop and the kitchen island, this area can act as another large prep or service area in the new kitchen. The perimeter kitchen cabinetry is from our Koch Classic line. Many times the term “flat-panel” gets categorized as a “simple” doorstyle. Simple is not a bad thing. Simple has staying-power! Truth is, a flat center panel framed with clean rails and stiles remains the most popular choice throughout all regions of design because it is simple. Flat-panel doors have been the top choice for many many years and that will not change. Koch’s “Aspen” doorstyle was the perfect choice for this project! Wide rails on the top and bottom lend more to the Modern look but the overall picture is classic. The two cabinets flanking the Stainless Steel hood have an added detail that helps give the range wall even more interest. 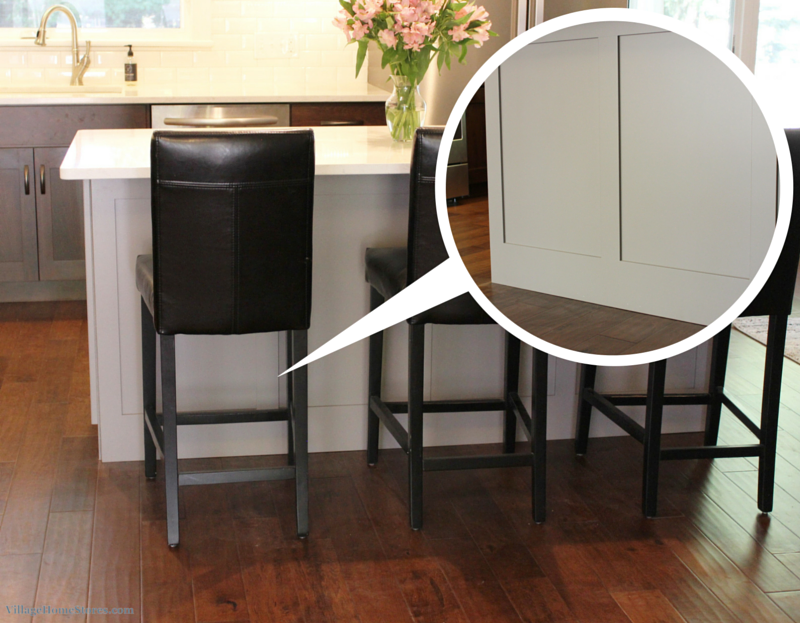 These 30″ tall wall cabinets were ordered with the doors configured in what is called a “70/30 Split” door layout. Note the smaller section on the top of the door. 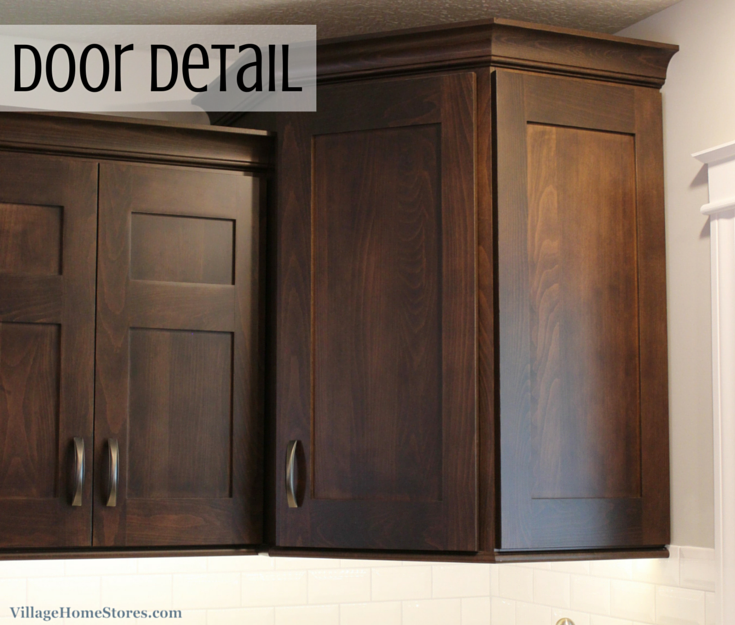 This top section is a fun area to add glass to a cabinet door without exposing the entire contents on display. 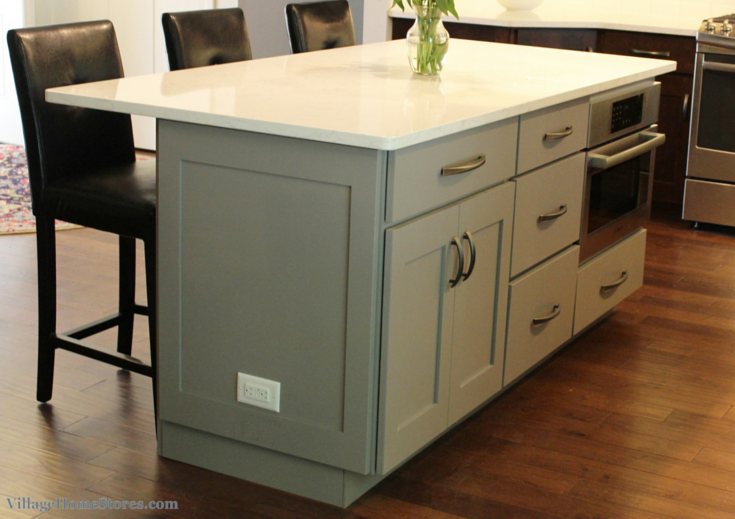 The same “Aspen” doorstyle was used on the cabinetry for the island. An end and back panel treatment that compliments this design was installed surrounding it. Including a microwave hood would have meant that the Stainless chimney hood would not be the main focal point of the range wall. Instead a drawer unit was installed into the island. Islands can be a great location for a built-in microwave option. This gray option opens up a whole new doorway into neutrals that blend well with medium to dark woods. Ask to see the “Fog” finish in person when you visit our showroom. 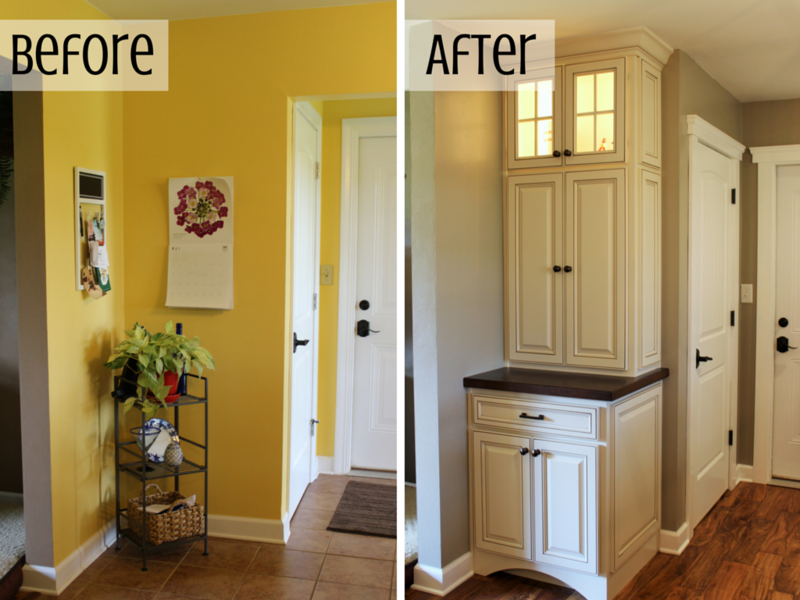 The homeowner was even able to repurpose an antique sideboard cabinet for a nearby wall and find a similar paint to cover it with. This helped carry the “Fog” color into the entire room. The kitchen sink is sometimes the final thought when designing a kitchen. 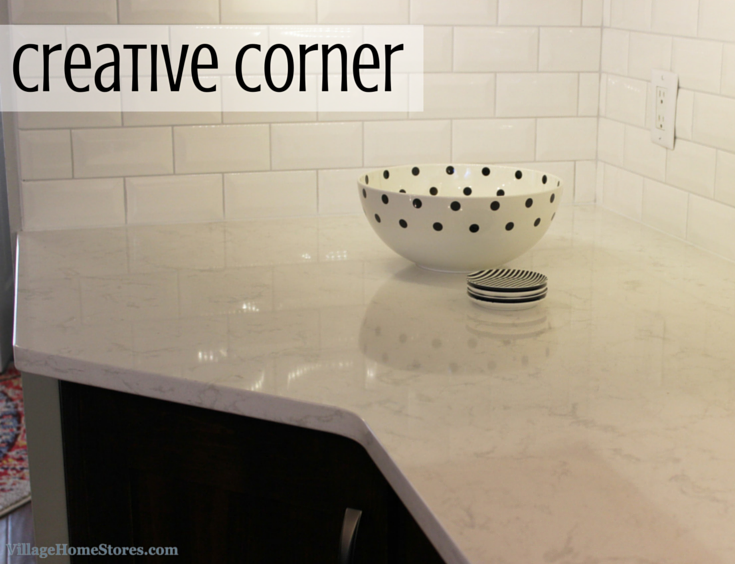 Don’t forget that your countertop and sink are two of the most used parts of your investment. 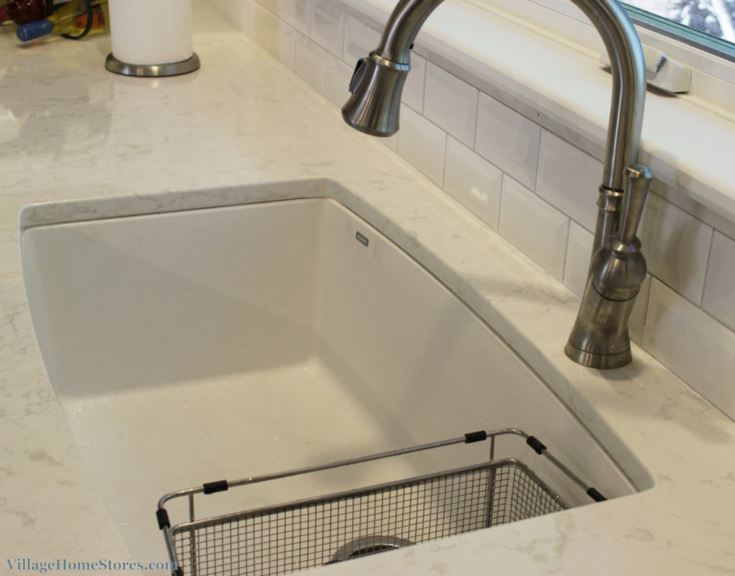 Cambria quartz countertops allow for an undermounted sink application. This means that clean up is a breeze. Not only will nothing harm or absorb into the Cambria tops, but a single wipe or swipe can land right into the bowl. No lip or ridge to keep you from sink access. 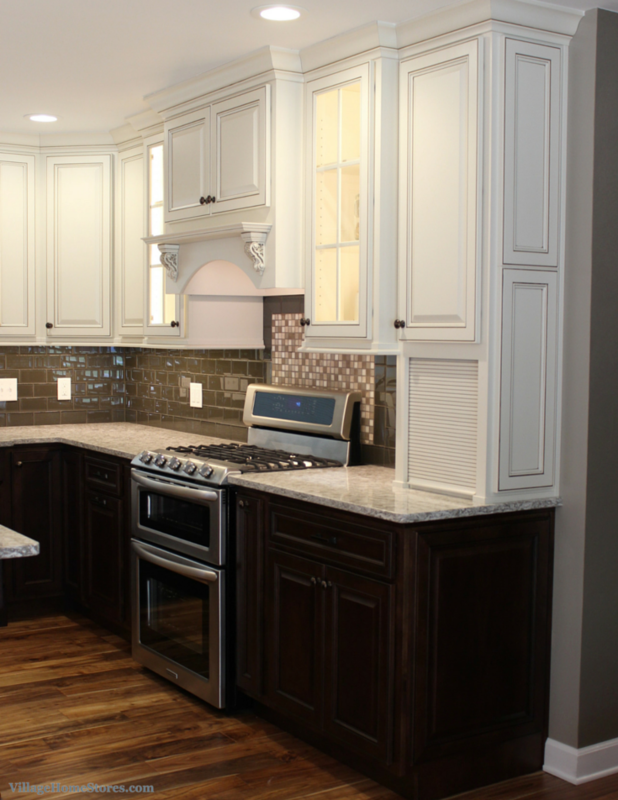 We are so glad to have work with this Bettendorf couple on the design and installation of their new kitchen. Remember that if you are just in need of an expert design Village Home Stores is here for you. 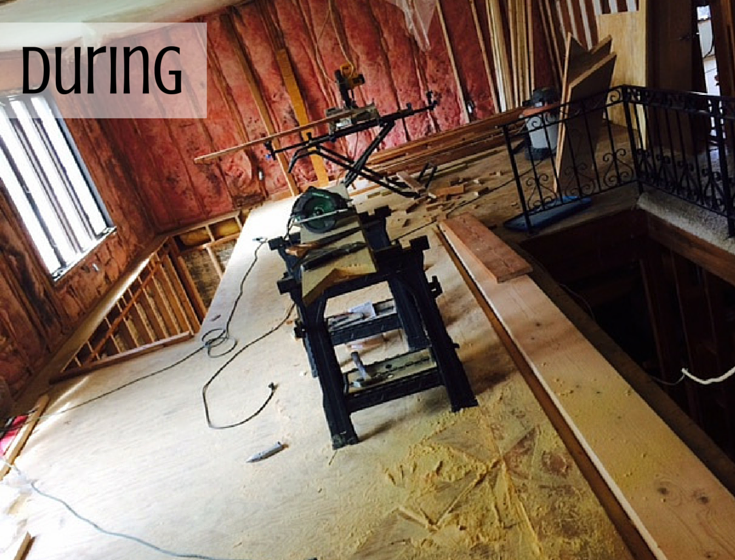 We can help as little or as much as you are needing for your remodel project. 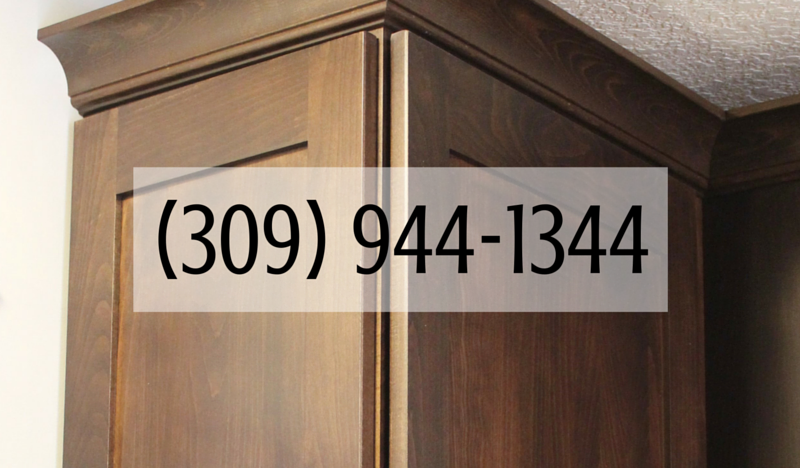 Contact us today to start the conversation about your dream kitchen or bathroom. (309) 944-1344. Like so many of our most successful kitchen transformation stories, this one includes the removal of a wall to open up the existing kitchen space to create a more open concept for the home. 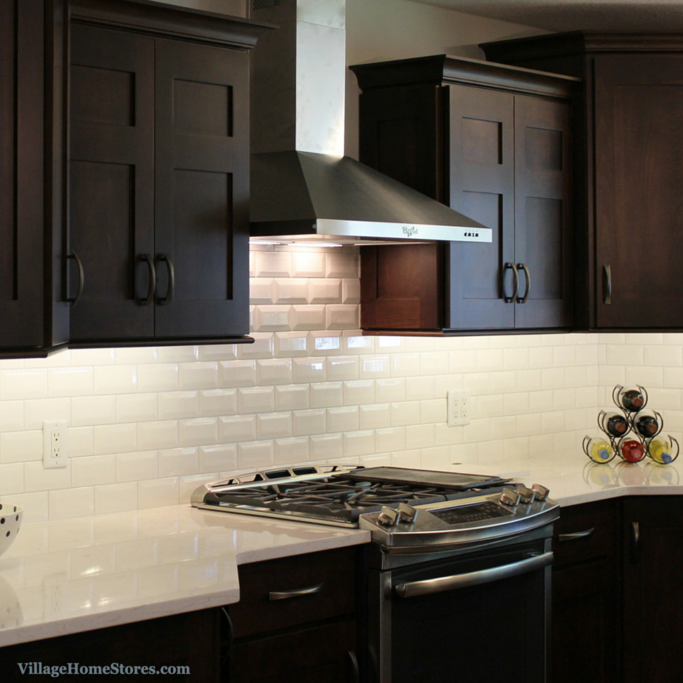 We loved this remodel project so much that we featured this kitchen on an episode of the Village Home Show. Also included in this episode is a tour of the adjacent bathroom that includes a Laundry area on the main floor. 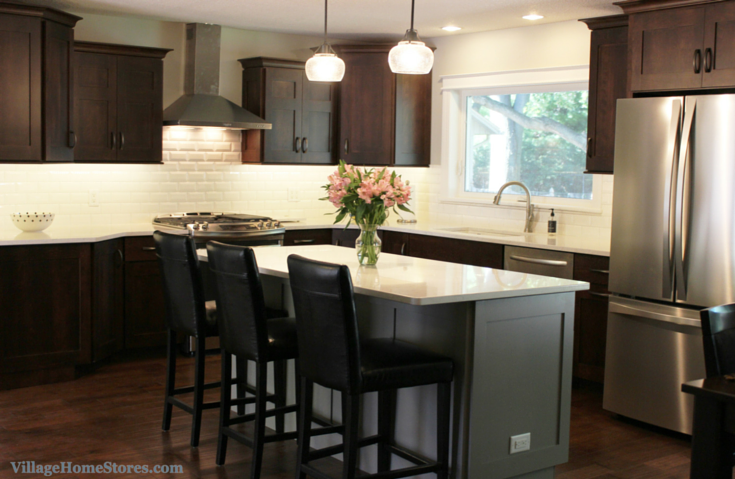 Living through a complete kitchen remodel can be quite a process. 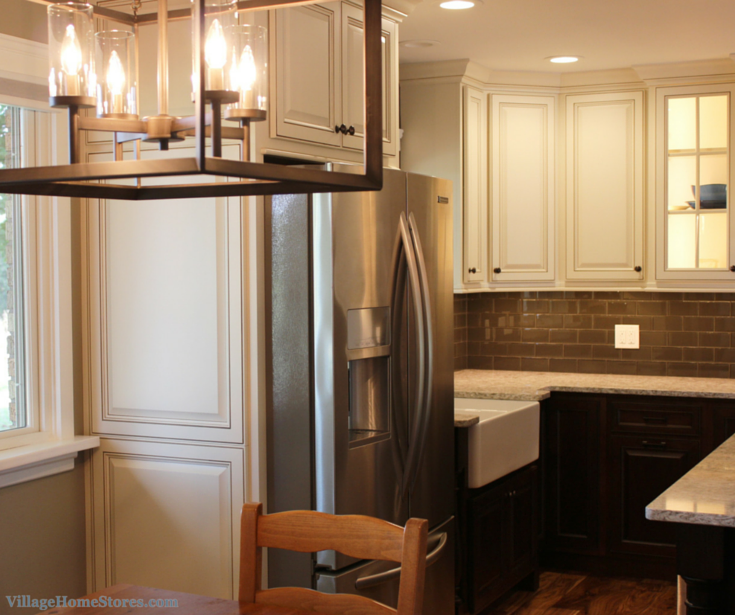 Kitchen remodels are so rewarding once complete, but they do take some time. 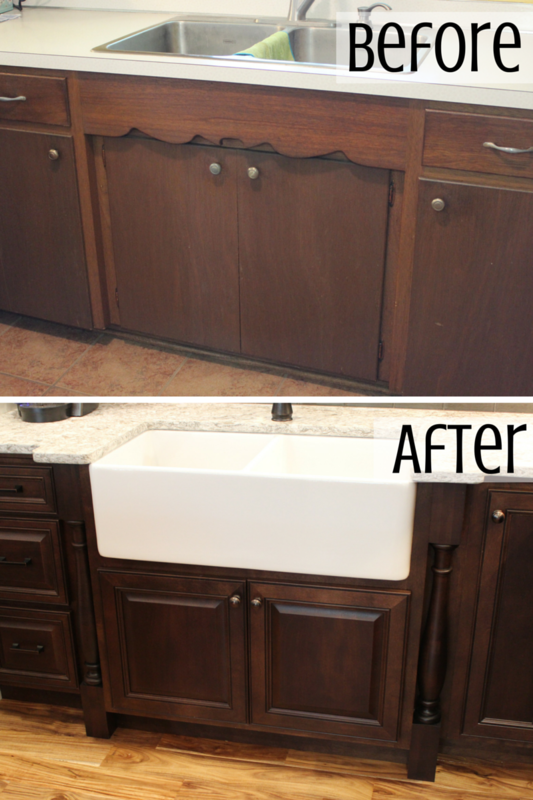 Great kitchen transformations like this don’t happen overnight. 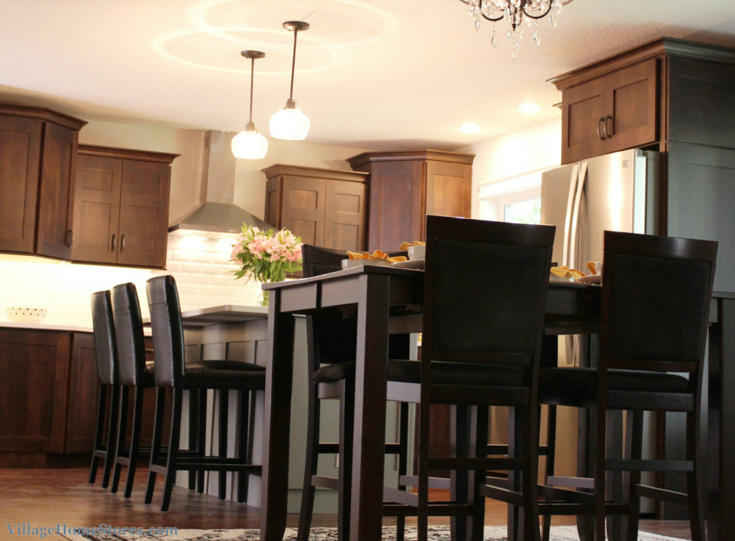 Watch this episode of the Village Home Show and see how this space was transformed from start to finish. By removing that wall the new kitchen is now a part of the front living room and natural light can pour in from all directions. This pair of Taylor Ridge newlyweds were not just challenged with the space restrictions of the existing kitchen, they also had a mix of personal styles that they wanted to be addressed. Located up on the sweeping hills of Taylor Ridge, the couple wanted to be sure to nod to the rustic setting even though their personal tastes were more timeless and Traditional. Their designer from Village Home Stores was excited to get to work on finding them the perfect selection or materials to give the right finished look to the space. Of course the look and feel of the new kitchen is only a fraction of what makes it a well-designed kitchen. The function of the design is most important, especially in your kitchen. Let’s start by looking at the layout of the new design. In the case of this kitchen, spreading out into the new space and adding areas for prep, storage and entertaining were key. A large island in the center of the design checks off all of these boxes. Even with the new large island in place, there is still plenty of room for a full dining room table on the opposite end of the room. A single level island was designed with adequate seating space for four (plus plenty of leaning up to and chatting space for many more). The island includes storage accessible from three sides and decorative paneling and trim all around it to give the look of a large furniture piece. This leaves the view seen buy guests Traditional and stylish from every angle. The island side facing the kitchen user includes the dishwasher and built-in microwave drawer. 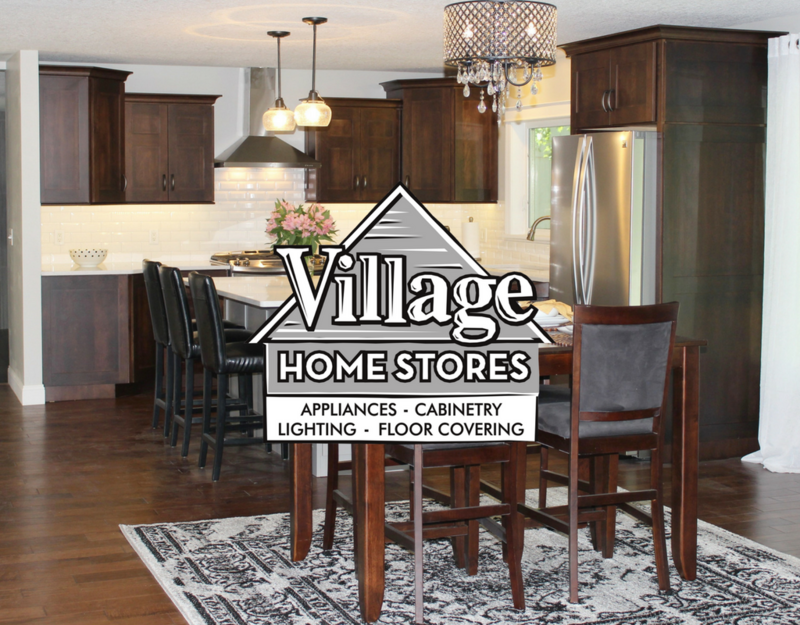 The entire package of kitchen appliances is from Village Home Stores and includes a 29 cu. 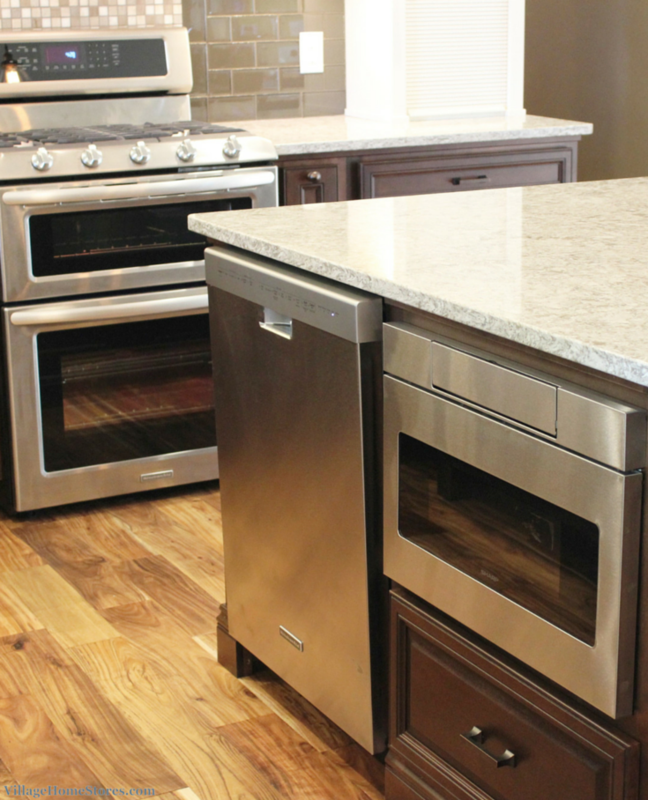 ft. refrigerator and double oven gas range from KitchenAid. A Sharp microwave drawer, and Broan hood insert have also been installed. With the dishwasher and microwave facing the sink and a wood hood in place of a stainless unit, there is less Stainless Steel in the overall first impression. This keeps the look updated but Traditional without having to invest in panel-ready appliances. 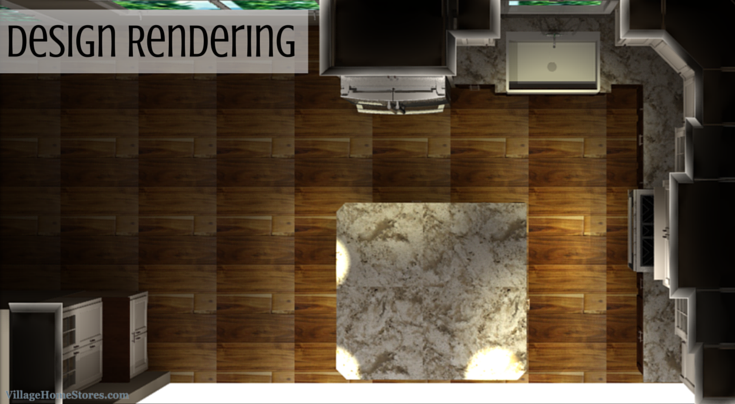 With an island this large you will want to use it for many tasks. 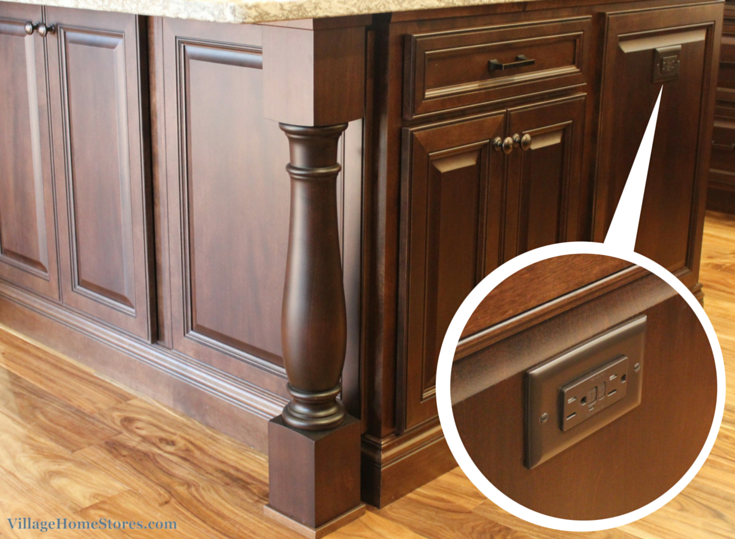 An outlet is camouflaged discretely on the end facing the cooking wall of the kitchen. Now small appliances can be used for prep and entertaining. Moving the refrigerator to the opposite wall helps to keep all of the main kitchen appliances in one zone of the kitchen. The large kitchen island is located right in front of the refrigerator to provides plenty of space for loading and unloading items. With the largest appliance to the left of the sink, that frees up the entire other wall for a chance to create a dramatic look for the new kitchen. Above the new double oven gas range is a wood hood with decorative corbels. Framed in by lighted glass-door cabinets on either side, this wall is the focal point of the entire room. Walking in the front door your eyes lock on this area right away! The main tile throughout this kitchen is glass subway tile appropriately named “Truffle” by Ann Sacks. The mosaic inset above the range is is from Epic Stone. This mosaic perfectly combines the colors of the field tile, Cambria Quartz countertops, and wall cabinetry. 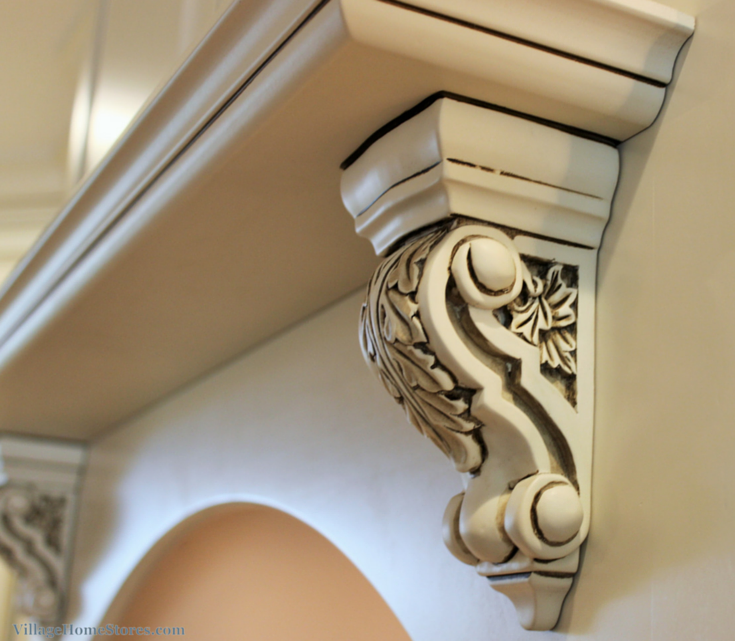 This scrolled corbel style helps anchor a Traditional style to the overall look. The painted “Pearl” finish on Koch’s “Royale” doorstyle has been accented with an “Umber” glaze perfectly showcased here on the corbels. 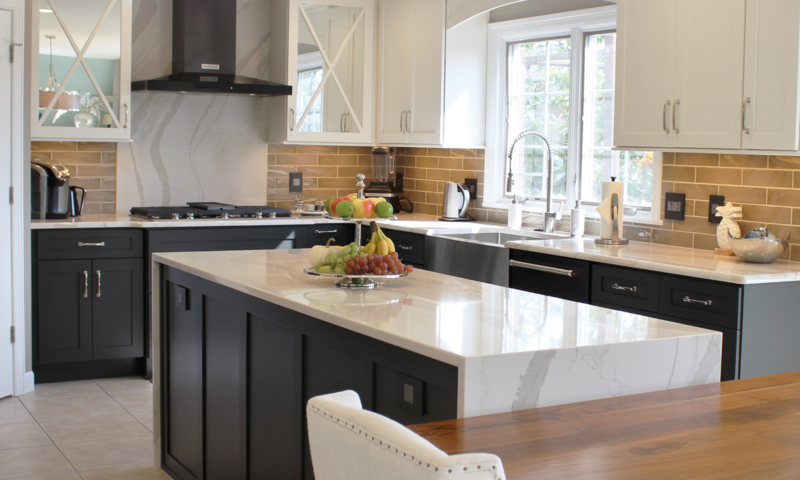 You may have noticed the contrasting island of this kitchen but did you notice the other bold contrast of this look …? The base cabinetry of this entire kitchen is a rich “Mocha” stain while all of the upper cabinetry and refrigerator surround is in the “Pearl” painted finish. This may be a bold concept to hear described to you but look at it in action here! The upper cabinets seem to almost “float” above and give the whole room a larger feel. This contrasting concept can be executed for all styles from Contemporary to Old World. 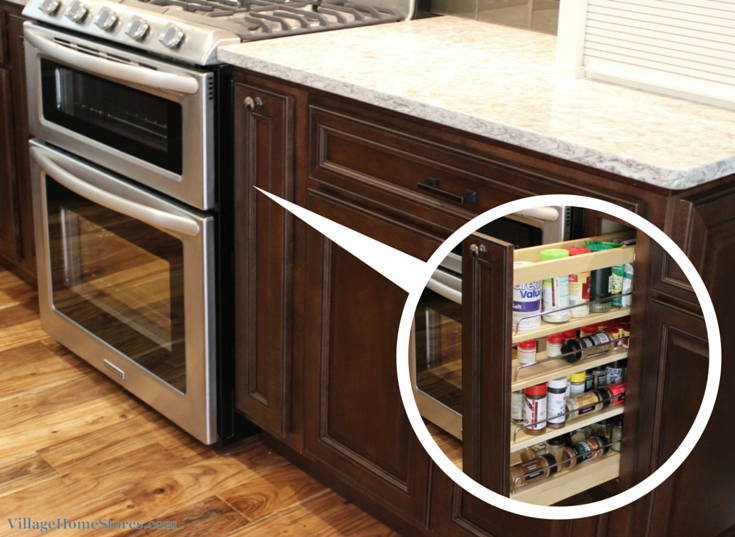 A pullout spice rack is accessible just to the right of the double oven gas range. these spice cabinets are available for both base units and wall units. Just to the right of this wall is the hallway that is now easily accessible from the open kitchen, dining, and living room. 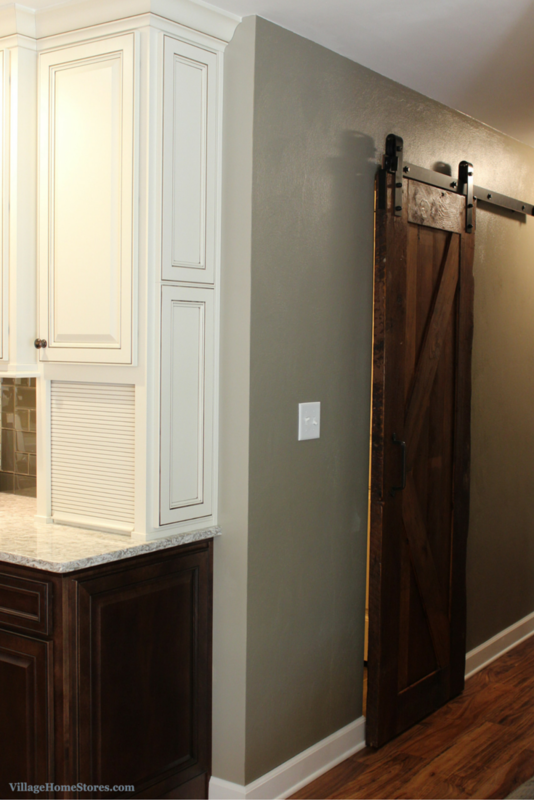 A handcrafted custom barnwood door by Character Interiors has been installed on sliding hardware that includes a lock on the interior. Behind this barndoor is a large double vanity bathroom with a tub shower and front-load laundry from Maytag. In the episode posted above in this post we give a full tour of this new bathroom space. Across the way, an unused corner of the original kitchen has now been given a brand new look. This built-in hutch cabinet helps extend the kitchen cabinetry into the dining space and give a customized look. The lighted top section of the wall cabinet provides a fantastic ambient light source and a space for displaying items. 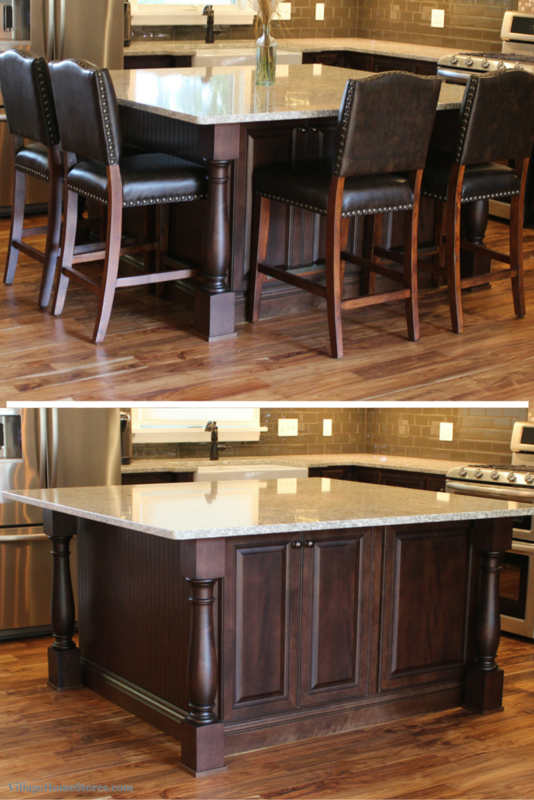 A custom wood top has been installed in the same finish as the island and base cabinetry from the main kitchen. 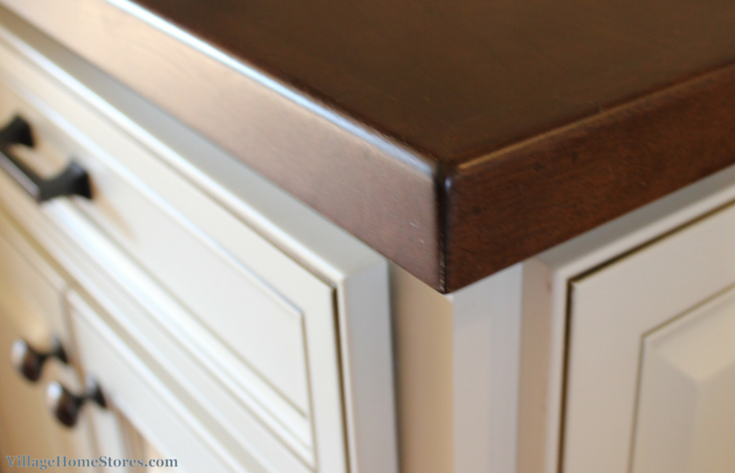 This helps tie the rich “Mocha” stain into the hutch area but keeps the entire section looking like a Traditional sideboard cabinet. Our Diode LED undercabinet system is installed underneath the painted cabinetry and inside of the glass-front wall cabinets. With a dimmer switch function added, these efficient lights can be used all day every day no matter what the mood is. There are two other great lighting zones in this gorgeous new space. 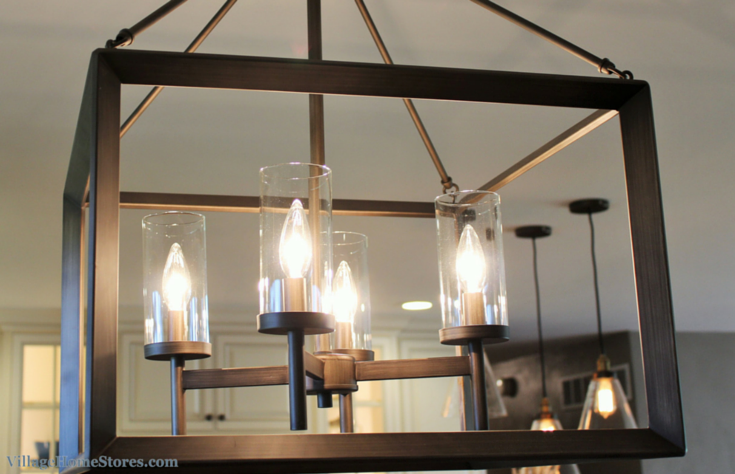 This Dining 4-light chandelier is from our Golden line. Exposed bulbs in clear glass caged in a dark finish keeps the light from seeming to large. You can see through it into the new kitchen and pendents just beyond it. 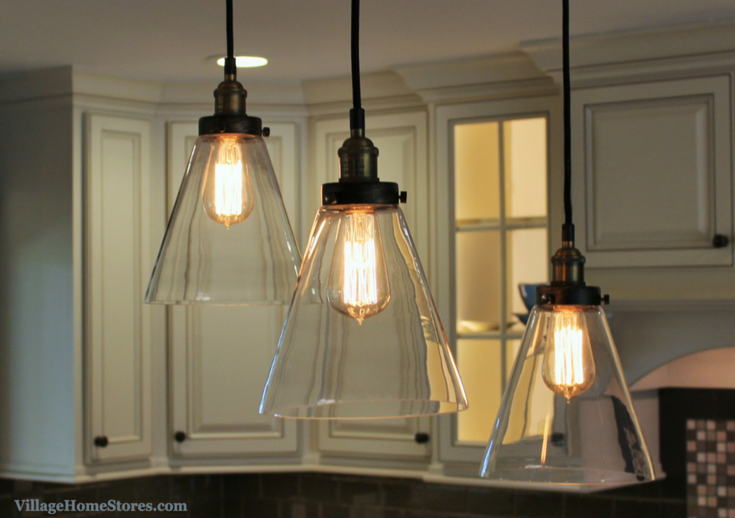 These 3 pendant fixtures are from our Minka-Lavery line. 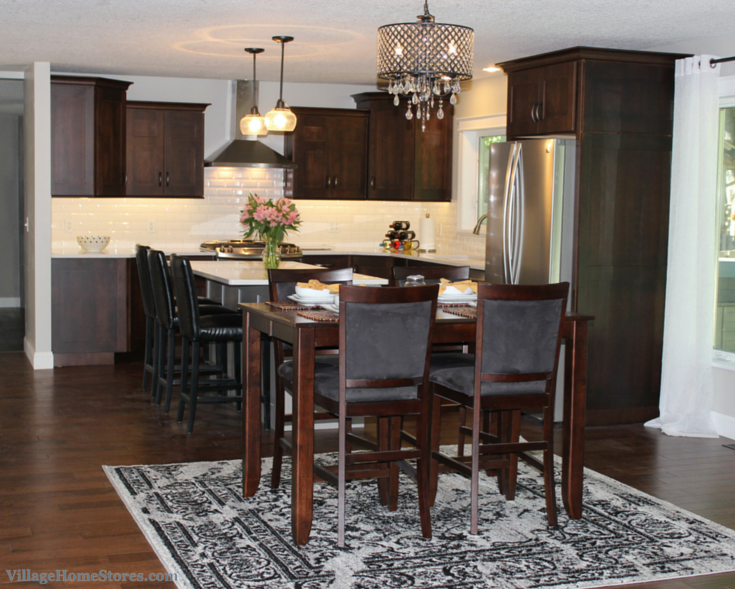 Hanging pendants above an island can be done in so many ways. we love the look here of a cluster of lights hung at varied heights. The visible filament of the “Edison” style bulbs and varied heights here help lend a more whimsical feel and add rustic Old World charm. Timeless and classic, but with a nod to the rustic setting of this countryside Taylor Ridge home. This kitchen turned out gorgeous! See the full album of photos from this project over here on our Houzz.com portfolio. We were so thrilled to feature this Quad Cities remodel story here on teh blgo and on our TV Show. Do you have your dream kitchen in mind but need a team that can make it look AND function perfectly? 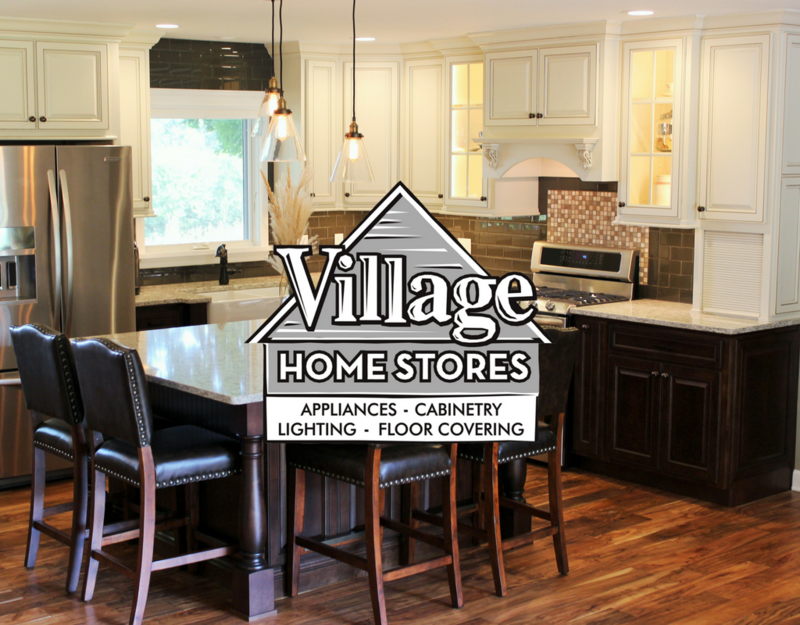 Let Village Home Stores make your dream kitchen a reality. Call or contact us today to get started.